HBC has been influencing public spaces for many years. As a team, with our clients, we aim to shape spaces for enjoyment, health, beauty, and the environment. We feel honored to be a part of these community and public spaces, and so many more. The courthouse design board and HBC team worked together to re-design the West Trade & Mint Street portion of the property to reflect the direction of the LEED accredited design of the annex. The new design includes public spaces like a pocket park, bistro seating under a grove, and incorporating the history of the site. Visitors and employees will be able to interact with the footprints of U.S. Mint and Assay Office and the U.S. Post Office, all located on the site in the early 1900's. At the center of the community of Brightleaf at the Park, the Village Green Park is a relaxing place to stroll through, meet friends, or simply sit and contemplate life. It is designed with open spaces for play, smaller, more intimate spaces for gathering, and a path for walking. It also includes an amphitheatre to bring the community together for special events. Throughout the Village Green Park, art displays are emphasized by the plants around them. Brunswick Community College is located in Bolivia, NC in Brunswick County. The Victory Garden is a memorial garden created to honor the Veterans of Foreign Wars of Brunswick County and designed to educate visitors concerning the veterans while doubling as an outdoor classroom for the college horticulture students. It is a place of reflection and relaxation for those who use this garden. Our company completed a set of design drawings that included a color master plan, demolition, staking, planting, irrigation, night lighting (12v for energy savings), and grading plans. The documents also included construction and material drawings with coinciding specifications. We assisted in procuring bids and managed the construction phase. It was important to make sure the final design was handicap accessible and would cause the least impact on the environment. This proved challenging given the existing contours and trees. Through our design documents, which included a site analysis map, soil analysis map, and habitat analysis study, we were able to achieve minimal site disturbance, which in turn brought down the overall cost of construction. To conclude the design process, we produced a master planting plan, grading plan, construction details for construction of the bridge, kiosk, gazebo, and paving, and remained a part of the bidding process. 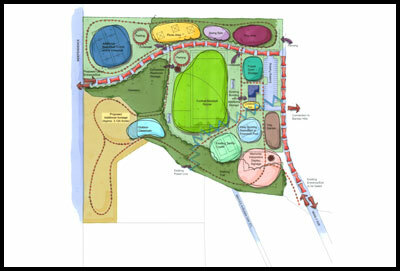 Re-design a 15.5 acre park located at the dead end street of Manly Avenue on Wilmington’s east side. The park is not used due to the location and amenities offered which exacerbates and attracts illegal activities. We worked with the “Friends of Maides Park” organization to gather historical information regarding the community fabric, neighborhood history and the vision the community had for the park. This information was gathered also through the four public meetings we facilitated. The initial meeting was to listen to the community, have them share their vision, and gather information to map out the future agenda. After conducting an analysis of the site and a city wide survey on features the community wanted, we produced a Bubble Drawing for our next public meeting. The community and the city staff continued to contribute through the design process. The final Master Plan evolved from the public meetings, community survey, and site design. The Oak Island Lighthouse, with its famed heritage, is listed on the North Carolina Historic Registry. It has long been a popular point of destination and receives numerous visitors. As a result, the Lighthouse is at a crossroads, in desperate needs of the type of site improvements that would correct and mitigate the erosion, compaction, and vegetative disturbance brought on by ever-increasing vehicular and pedestrian traffic. With an emphasis on historic preservation, our goal is to prevent demolition and to restore, rehabilitate, and reuse existing structures to benefit the community, while helping to ensure that needed new construction is compatible and complements the character and distinction of the older neighborhood.